It's great to see one of Rune Grammofon's definitive acts making a return: it's been nearly two years to the day since the concert DVD Supersilent 7 saw a release, but a full four years since the band last delivered a full studio album (Supersilent 6 if you're counting). Since Supersilent's inception the various members of the group have catapulted themselves to solo stardom (if indeed stardom is a term applicable to avant-garde Norwegian jazz), with trumpeter Arve Henriksen and super producer Helge Sten (aka Deathprod) coming close to overshadowing the band's success with their solo efforts - both Henriksen's Chiaroscuro and Deathprod's epochal 4CD box still get heavy rotation round these parts. Supersilent 8 comes as a decidedly triumphant return for the band, finding them venturing into musical terrain even more difficult to categorize than on prior releases. Having released a triple disc debut album characterised by noisy free jazz convulsions the group somehow ended up at the comparatively sedate Supersilent 6, a kraut-ish, post-rock influenced affair that provided an entry point for a whole new audience. This latest release is something else entirely. From the uncompromisingly obtuse real-time soundscaping of album opener '8.1' you know this isn't going to be a particularly easy ride, the band quietly stumbling their way through Popul Vuh-styled synthesizer explorations with a growing undercurrent of somnambulant, arrhythmic drumming and tides of low end fuzz worthy of Sunn O))). It's a pretty heavy-going workout, and just when you're expecting something ferocious to turn up at any minute, it doesn't. Instead you get the meticulously disciplined '8.2', a piece dominated by Jarle Vespestad's infinitesimally detailed percussion. Next up, Vespestad gives his toms a severe punishing on the angular feedback sculpting of '8.3', whilst the fourth piece marks a step back towards low volume dynamics and eerie, mellifluous harmony. Storlokken's synthesizer joins Henriksen's trumpet for one of those explosions of improvised melodic coherence that would be beyond the limits of most improv ensembles. Every turn finds the group aborting one creative path and inventing another, reaching a new extreme on the electronic formlessness of '8.6', in which Henriksen calls upon his oddly disembodied falsetto vocal for a duet with some especially fractured-sounding Deathprod electronics. if Autechre were to release an album on ECM, this is what it would sound like. The final fifteen minutes marks a return to more conventional improv, with the band in top form on the combustive noise textures of '8.7' (think Flower-Corsano Duo with added Radiophonic weirdness) only to wind down into the spooky electronic jumble of the eighth and final improvisation. 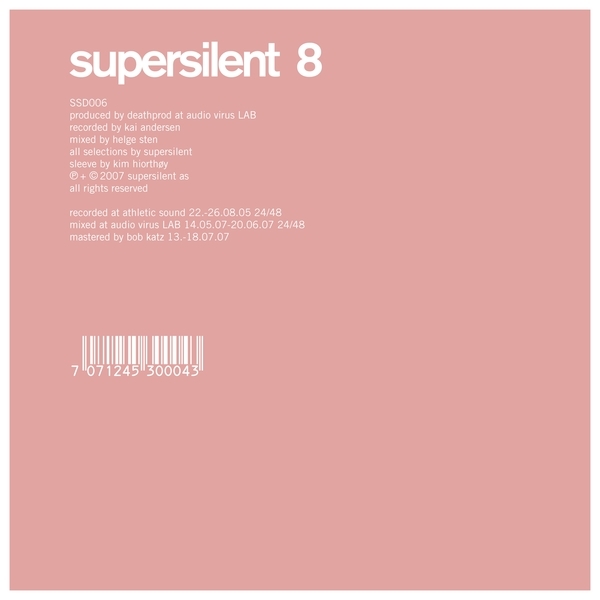 Supersilent 8 is an impossibly rich banquet of sonic abstractions, and could hardly sound less like music that's been made up on the spot - I mean this is astonishingly complex material, to think that it's just been pulled out of the air is beyond impressive. The production of Supersilent 8 deserves a special mention too: the warmth and spatial clarity of the instrumental recordings is freakishly good, the entire project lovingly presented in that shroud of vintage analogue sound that's so synonymous with Deathprod's mixing. It would be no overstatement to rate this as one of the very finest entries into Rune Grammofon's esteemed catalogue.